Although the first two categories are of interest to collectors, especially the last category is most annoying to the collecting community. 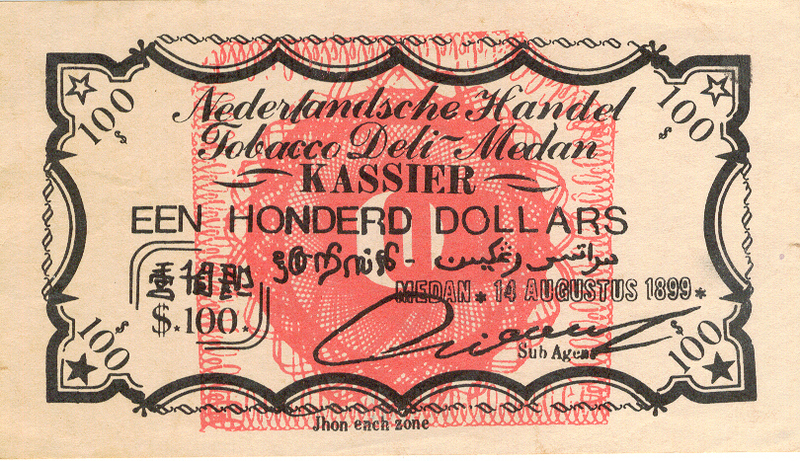 Years ago, Netherlands Indies paper money was mainly collected by some Dutch collectors that included the overseas territories in their Netherlands paper money collection. 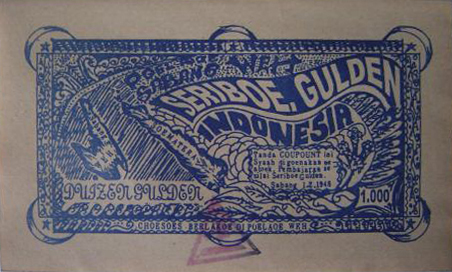 More recently, also Indonesia became more aware of its past and the improved local economic situation allows more Indonesians to spend money on collecting. There is even a tendency where Netherlands-Indies and Indonesian paper money sells at higher prices in Indonesia than in Europe. 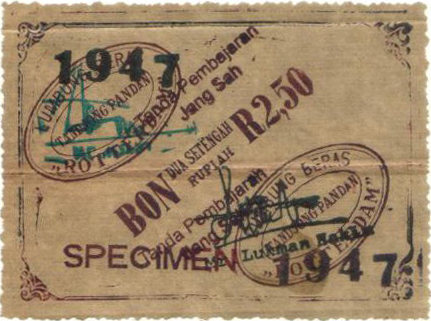 In recent years, several Indonesian auction houses were founded that offer an impressive selection of much sought after paper money. For better quality and more scarce pieces the prices have risen significantly. Unfortunately as soon as these items become expensive, falsifications also start to surface. This collecting area is still in its early days and therefore it is likely that unknown issued or proof notes might be discovered. The relatively low average salary level combined with the skilled craftsmanship of the Indonesian people make paper money an easy target for falsifications. 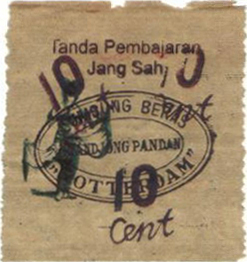 When an unknown Netherlands Indies or Indonesian note appears on the market it is therefore justified to be suspicious about its authenticity. Below I have listed an overview of paper money that I have classified as “modern falsifications”. This list is not complete and newly identified forgeries will be added as they surface. In december 2007 I bought four notes from Tandjong Pandan, the main town of the Indonesian island Billiton. 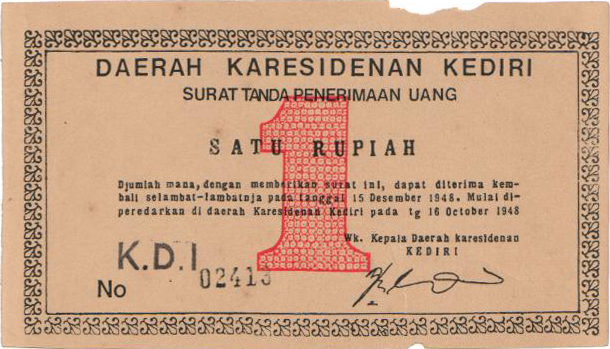 The notes carry no serial number identification which is unusual for notes in this period, especially for notes with a denomination of 1 rupiah and higher. 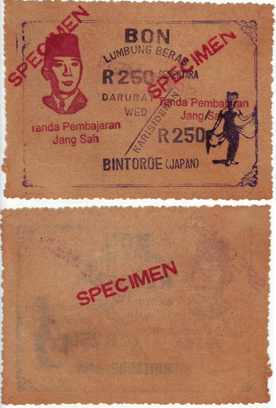 The notes do not have a specific date of issue, only the larger one has 1947 printed, but no day and month which is also unusual for notes in this period, especially for notes with a denomination of 1 rupiah and higher. 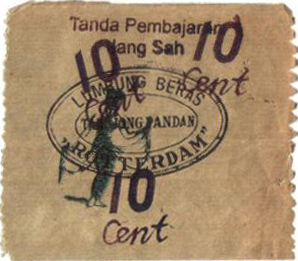 One note mentions Cents (Dutch) as denomination; the other one mentions Rupiah (Indonesian). 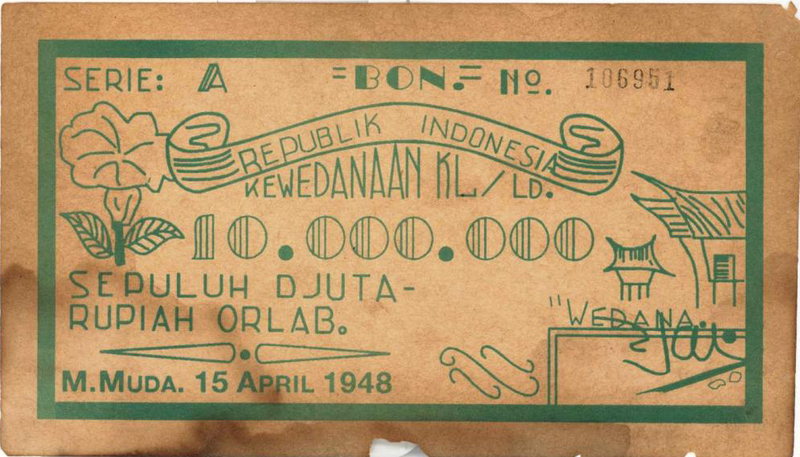 During the revolutionary period the new Republik Indonesia discouraged and prevented the use of any reference to the Dutch colonial period on its paper money. The paper has several folds. Especially the larger note has a strong horizontal fold in the middle where the paper has been damaged. Looking with a magnifier, the printing ink shows creep into the paper at the fold and also has no ink on locations immediately next to the fold; These are strong indications that the printing occurred on paper that already had the folds. 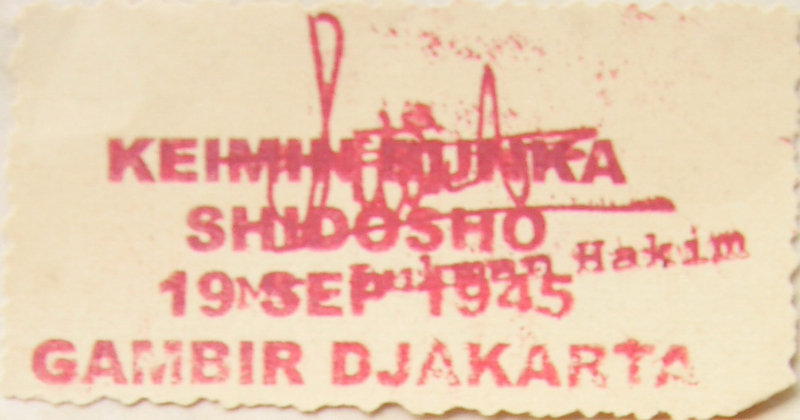 The large note carries the signature and name of M. Lukman Hakim who later became the governor of Bank Indonesia (1958-1959). It is known that he called himself Loekman Hakim since he followed the old spelling, just like Soekarno did. 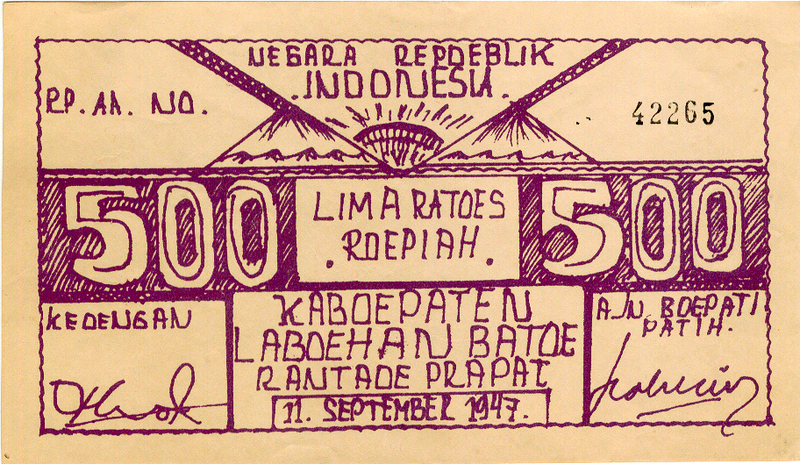 The signature of Mr. Loekman Hakim does not resemble his signature that is printed on the ORI BARU notes of 1949. 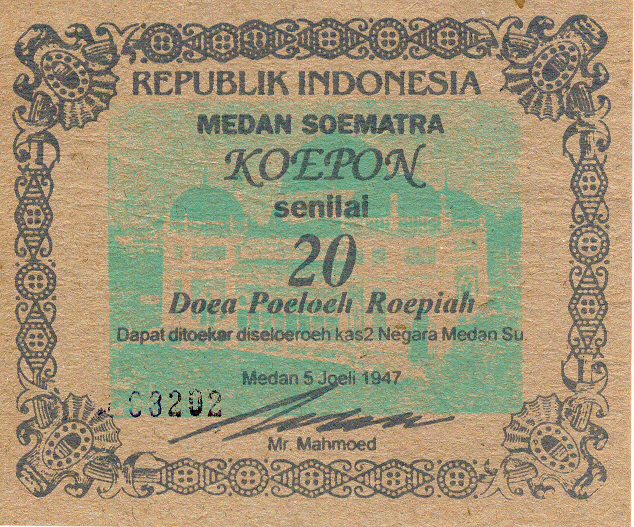 The cutting perforation of the notes is not used on any other Indonesian note and has no clear functional reason. “This is a note from a series that contains a 100, 500 and 1000 denomination. These are recent falsifications for sale to tourists visiting Sabang, which is a most attractive island, especially loved by scuba divers, located near the coast of Atjeh at the most western point of Indonesia. These notes are regularly offered on eBay for sale. Looking at the revolutionary period in Indonesia between 1945 and 1949, the so called struggle for independence, there were parts of Indonesia where the Dutch were in charge and parts where the new Republican government was in charge. The status of Sabang during these years is not very clear. However the Dutch did not issue any local money during this period, they only issued NICA money in some territories and re-introduced the old Javasche Bank money where NICA was short on supply. Later they issued new Javasche Bank money in several area’s. 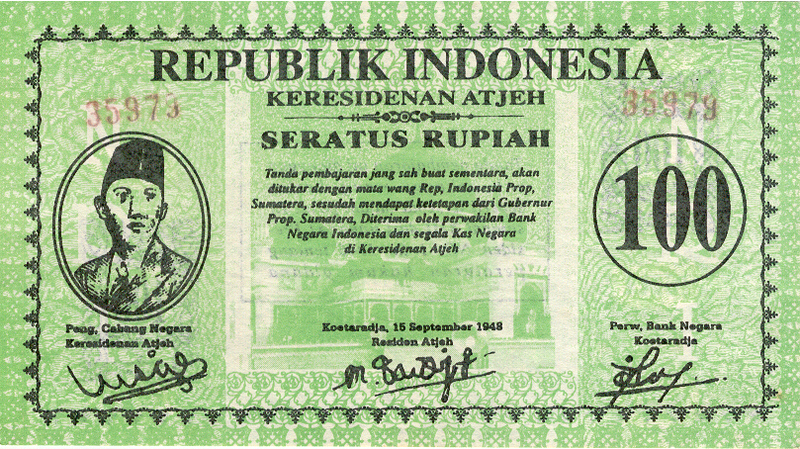 The Indonesian government issued the ORI money on Java and later they issued ORIPS money on Sumatra. 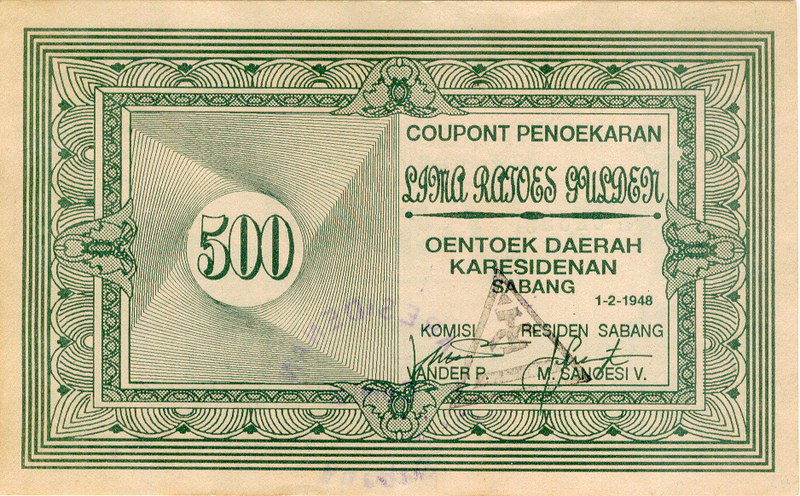 Because of logistical problems with the distribution of ORIPS money some local governmental institutions issued their own local money, like the Asahan province. The Republican money for the Atjeh area was printed in Bukkittinhi and was also called ORIPS money. 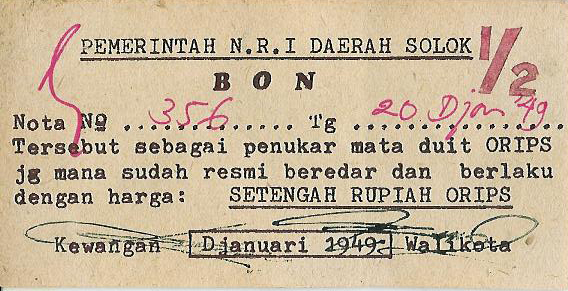 There are no historical records of Sabang printing or issueing own money. 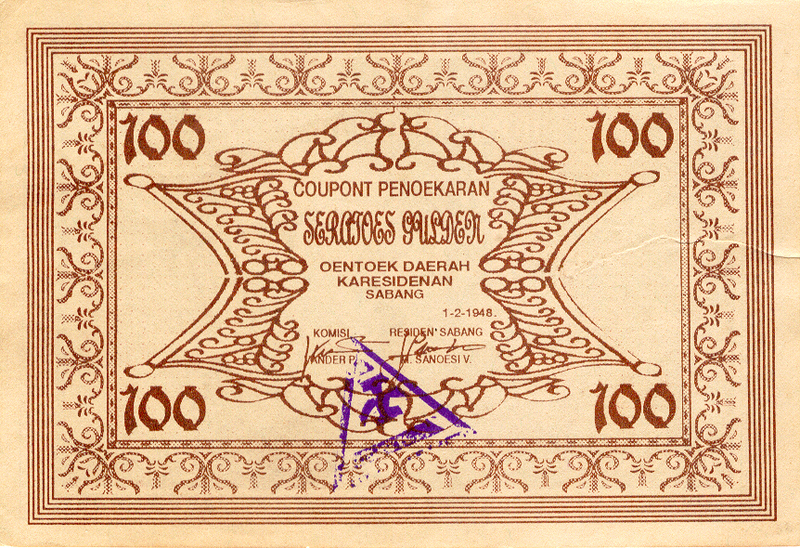 If the Dutch would have issued local money in Sabang, it would for sure be Dutch money, in Dutch language and on high quality paper. 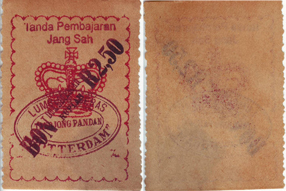 The notes mention the name VANDER P, which possibly refers to Van der Plas, one of the highest ranking officials in the Dutch Indies at that time. It is unlikely that he would have been the signatory of any local issued paper money. Also there is no logic to just mentioning part of his name. 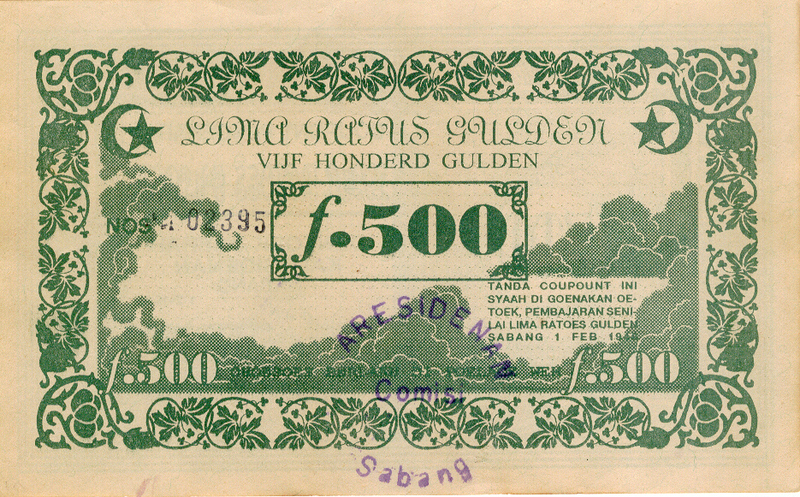 Most text on the notes is in Malay while the denomination is in Gulden. 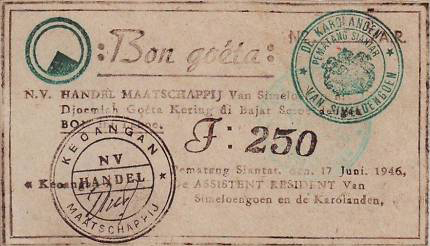 The spirit of those times was that the Dutch would have issued paper money using Dutch text, mentioning only the denomination in both Dutch and Malay, like all the other issues in that period. 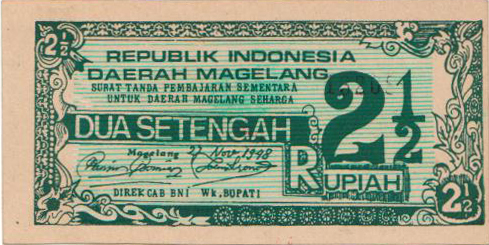 If the Indonesian Republic would have issued local money in Sabang, it would for sure mention Rupiah as the denomination. There was a strong sense of nationalism within the Republican party and it is sure to assume that any reference to the Dutch colonial period would be prevented. 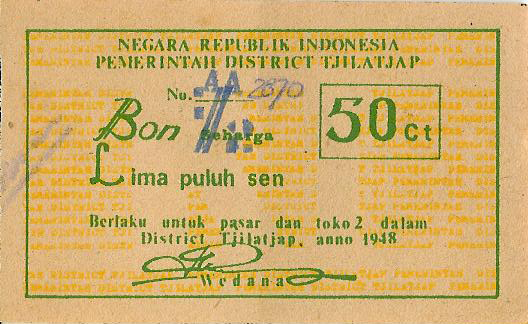 All the local issues of the Republic Indonesia mention Rupiah’s during that period. 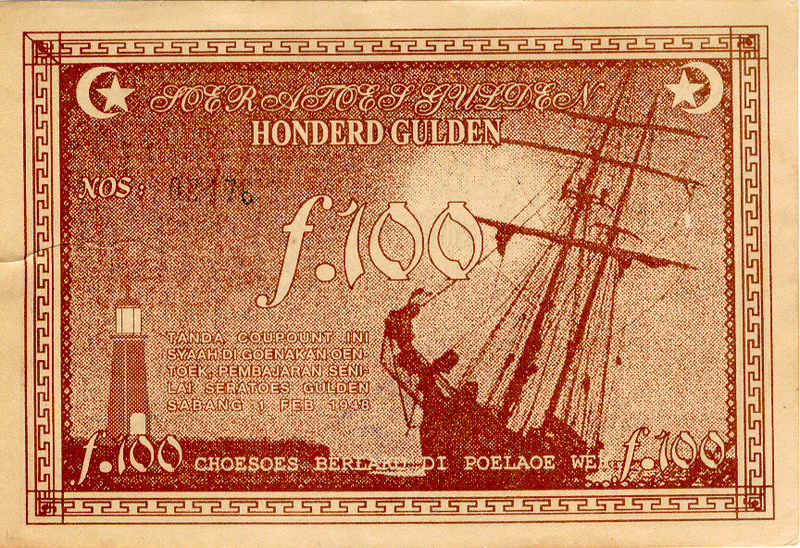 Furthermore the 100 and 500 gulden notes have the F. sign in front of the denomination which refers to the Florin, the old Netherlands word for Gulden. 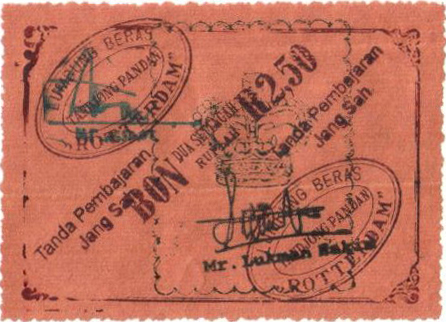 It is highly unlikely that the Indonesian Republic would all of a sudden start using this historic notation, that was last used on Dutch Java Bank banknotes in 1864, on a small and distant Indonesian Island. 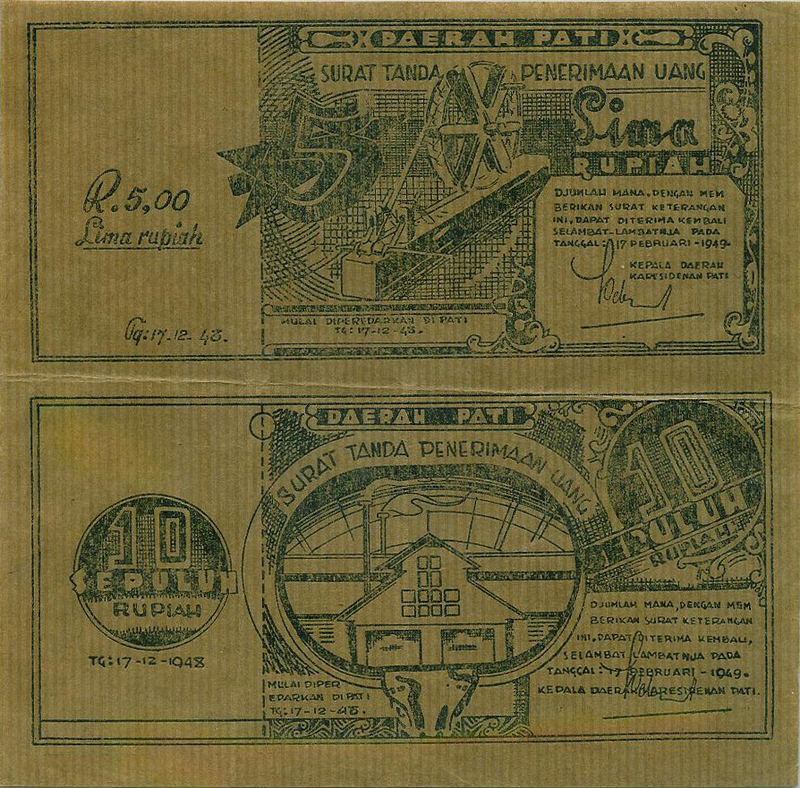 Next, the notes have the Islam sign with star and crescent moon printed on the note which is not observed on any genuine Sumatra notes of that period. 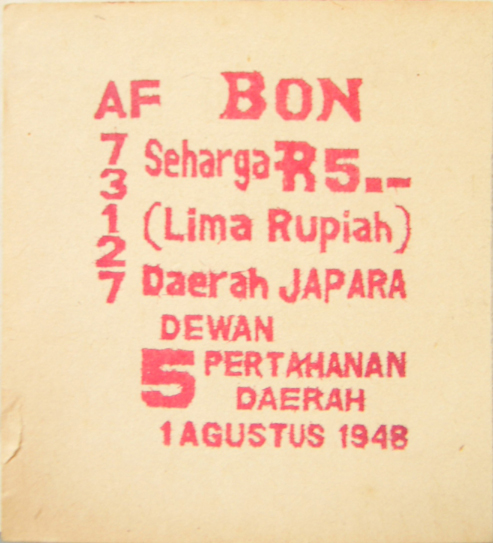 There are two notes listed in the Katalog Uang Kertas Indonesia KUKI (HP-3 and HP-4) both issued by Negara Islam Indonesia (NII) at Cirebon, Java in 1949, unfortunately the author of the catalogue was only able to provide poor quality black and white copies of these notes. I studied the paper, the designs, the printing techniques, the texts, the signatories, the history of the area’s, etc., etc. Each note appears to be very amateurish but there was something I could not yet put my finger on. Then I studied the serial numbers of the notes and, all of a sudden, I found a match between all these notes that are supposed to cover a period of almost 50 years. All serial numbers have 5 numbers and most notes seemed to be printed with the same number printing machine. The character set and size is the same and most notes show a serial number where the 4th number is printed a little higher than the other numbers. It seems like all these notes could have been manufactured by one and the same counterfeiter using the same equipment. Most of these notes were sold in Singapore.